Want to teach English as a Second Language? We can help. Serving close to 20,000 learners each year, we are Canada’s largest provider of English as Second Language (ESL) programs and rank among the top for North America. Our program provides new approaches and practical activities designed to build your confidence and prepare you for the classroom. Learn theories and methods for teaching ESL. Find out what the latest research says. Become part of an active and vibrant community of practice. 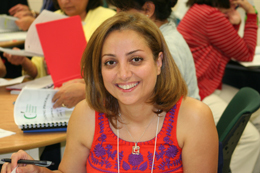 At the TDSB, we offer certification courses for those who want to Teach ESL, as well as post-certificate training to enhance your skills in specific areas. Become a certified ESL instructor through our Teaching English as a Second Language (TESL) program.